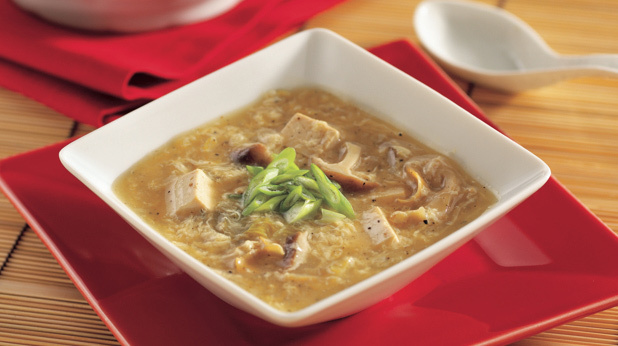 This Go Red recipe for a Chinese-favorite soup with tofu is a great source of protein. Put the tofu on a large plate. Sprinkle the tofu on both sides with 1 tablespoon curry powder. Using your fingertips, gently press the curry powder so it adheres to the tofu. In a large microwaveable bowl, microwave the vegetables and water on 100 percent power (high) for 2 to 3 minutes, or until they are almost tender-crisp but still have some crunch. Pour off any remaining water. In a large nonstick skillet, heat the canola oil over medium-high heat, swirling to coat the bottom. Cook the tofu slices in a single layer for 3 to 4 minutes on each side, or until browned. Transfer to a separate large plate. Cover loosely to keep warm. In the same skillet, heat the sesame oil over medium-high heat, swirling to coat the bottom. Cook the onion for 1 minute, stirring frequently. Stir in the vegetables and garlic. Cook for 1 to 2 minutes, or until the vegetables are tender-crisp, stirring constantly. Stir in the coconut milk, chili garlic sauce, and remaining 1 1/2 teaspoons curry powder. Bring to a boil, still over medium-high heat. Spoon the vegetable mixture over the tofu. This recipe is brought to you by the American Heart Association's Go Red For Women movement. Recipe copyright © 2016 by the American Heart Association. Look for other delicious recipes in American Heart Association cookbooks, available from booksellers everywhere or online at heart.org/cookbooks..